After purchasing my Windows 7 laptop, the first thing I got irritated was the sudden dim of the desktop while doing some works on it. The same effect can be seen while you are changing the major settings of an installed application and your PC will ask you to continue the operation. Once you click any of the buttons, your desktop will go back to normal. This effect is because of the default Operating System settings which dim the desktop while any programs installed attempting to make changes on the computer. It is one of the security measures from Microsoft to protect users from the undercover working of hidden applications or any malicious programs which make changes on the system without the knowledge of the user. Though this function irritates us sometimes, it has certain benefits. Let us consider a scenario where one malicious application somehow got installed on a computer and tries to perform certain actions without the permission from the user. Smart malicious applications can hide the message box from OS to notice the attempt of the hidden installing or changes and it is possible for a user to ignore the message box if he is doing some serious works. When the desktop is dim, the user will be aware of the incident (most importantly, he will read the alert) and successfully deny permission and notice the presence of a malicious application on his computer. What If You Don't Want to Notice System Changes at High Priority? It is understandable that most users don't like to be disturbed while working and the sudden dim of the desktop may annoy them. 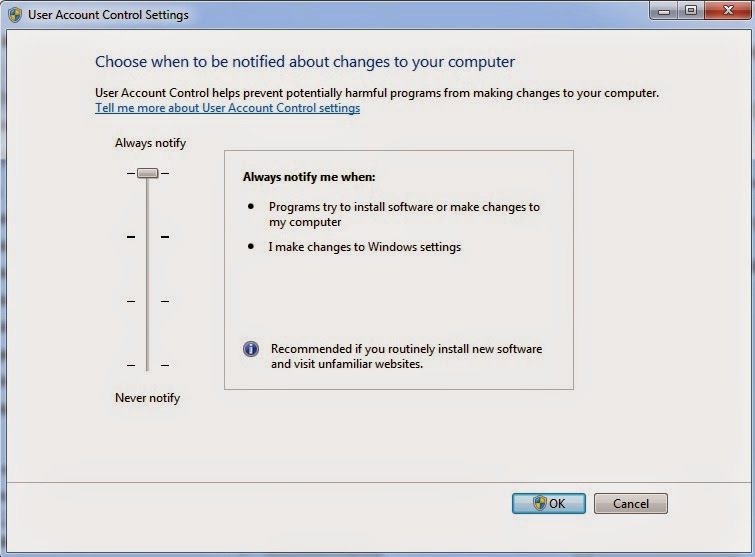 If you find it is difficult, you can change UAC (User Account Control) settings to lower levels by following the steps below. There are other levels of notifications with fewer disturbances. It is also possible to turn off this notification completely. 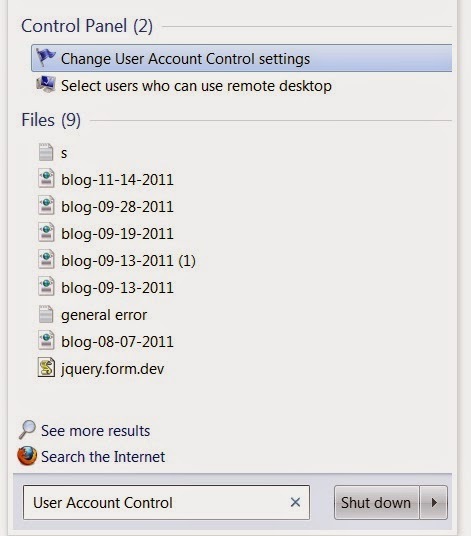 Now you can see how to select another User Account Control option with lesser impact to notify the activities of installed software applications. 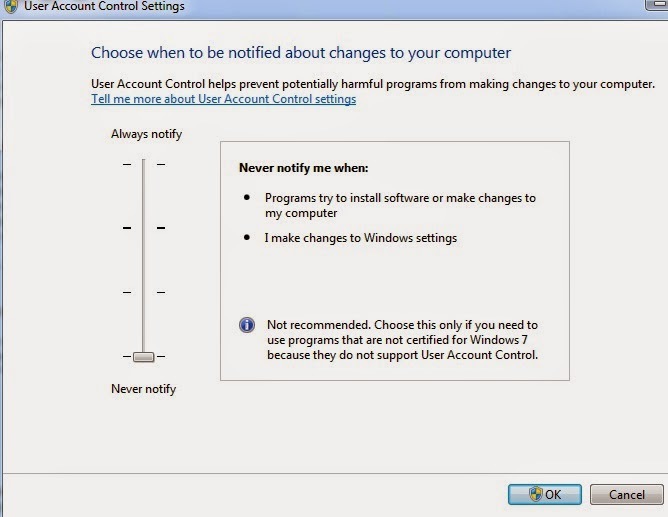 Now you can choose from four options of the Windows 7 notification methods. If you want maximum protection from hidden installing of suspicious applications on your computer, you must choose the option "always notify me". 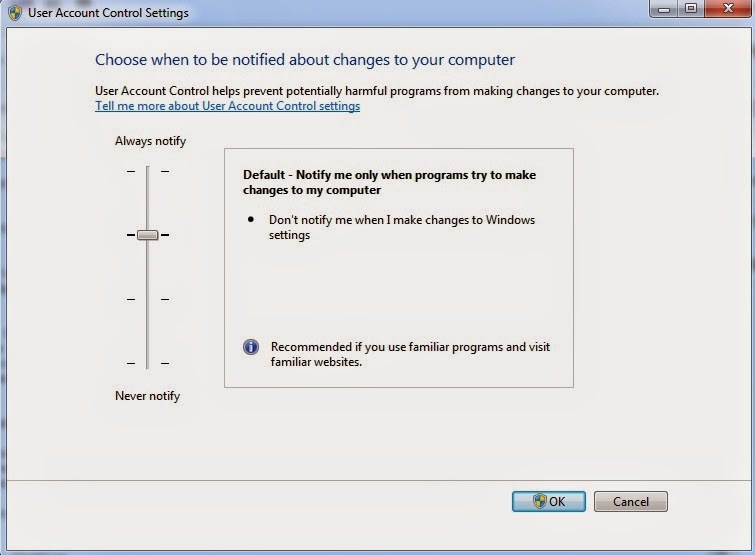 Once this option is selected, your desktop will dim when you or an application tries to make changes on your PC. Due to the desktop dim, you will never ignore the warning accidentally and no applications on your computer will get a chance to make critical changes without your permission. This one is better than the first option if you ask me because this option dim the desktop only when applications try to make changes to the system. You will not be disturbed when you make changes to Windows settings by yourself. So this option is ideal for an average user. Click on the OK button to save this setting. If you select this option, you will be warned about the attempts of software products to change your PC without dim the desktop. 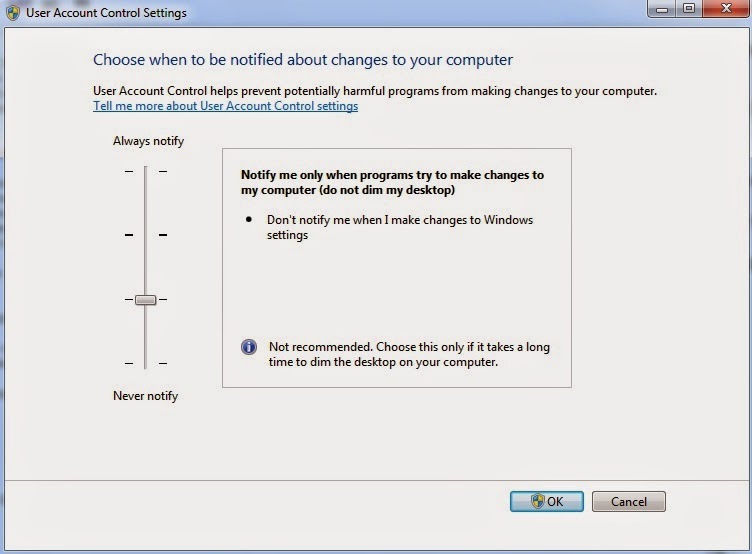 You will not get a warning about the changes you are making in windows settings by yourself. If you are not caring about the changes made by installed applications on your laptop, you can select the last option. By default, it is not the recommended option.